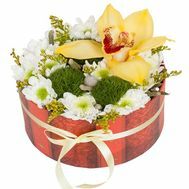 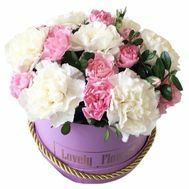 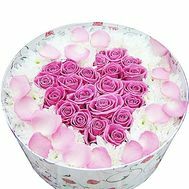 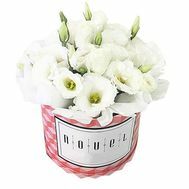 Flowers box - this is an original and extremely romantic gift, which suddenly gained popularity in the floristic market of any country. 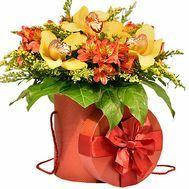 Flowers in hats are now a fashion trend that has entered the international market. 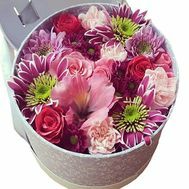 And it's not surprising, because the sight of an unusual box provokes intrigue and interest, but it's worth discovering it - as a composition of real flowers will hit the recipient in the heart. 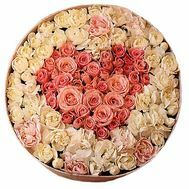 What is this amazing box? 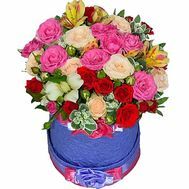 Its secret is extremely simple: florists select a box in which the flowers are placed in a floral sponge, and afterwards this miracle is impregnated with water. 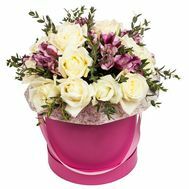 Thanks to its simple design, the flower box of the flowers preserves moisture for a long time and does not need special care. 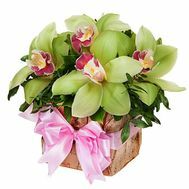 Buy flowers in the box is simple: in our flower shop, you can order flowers with home delivery at any time of the day or night! 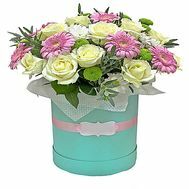 Bouquets in boxes: what is it and what are they for? 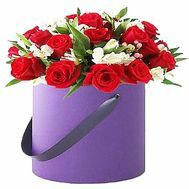 A hat box is not a novelty at all, as many people think. 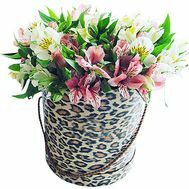 Previously, it was used to store hats - women's favorite accessories. 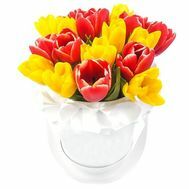 Now it was changed by designers and used for a variety of purposes, including floristics. 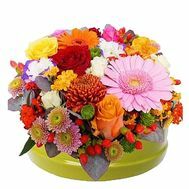 Our online store is full of beautiful colors in boxes, the variety of which is breathtaking. 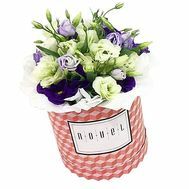 At us it is possible to get compositions for any taste and to pick up such their combination which in a compartment with a box will make the present furor. 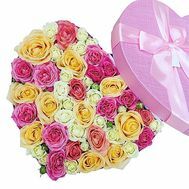 What does the box of colors mean? 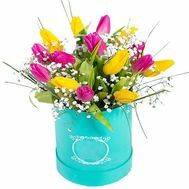 A capsule with flowers can have any shape and filling: you can pick up different flowers for decoration, as well as different boxes. 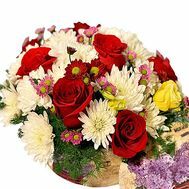 Flowers have always been and will be the present, which is expected for the holidays. 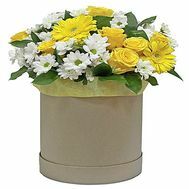 But even such a simple gift can be made original by choosing fresh flowers in boxes. 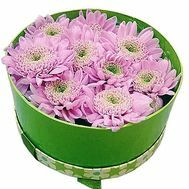 Buy it can be at affordable prices and at absolutely any time of year, which makes such a box indispensable. 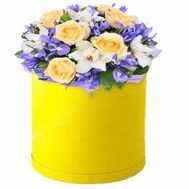 The most popular in our store are boxes with roses: lush, bright and passionate. 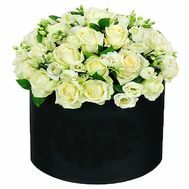 For those who do not know what is best to give or doubt the choice of a bouquet, and roses in the box will do. 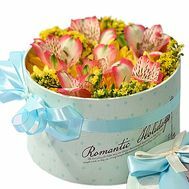 Buy them can be on a romantic holiday on February 14 for your beloved or on the anniversary of the relationship. 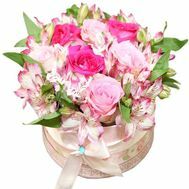 Special attention should be paid to the alstroemerias in the box: small and fragile, which will be an excellent gift for the mother on 8 March. 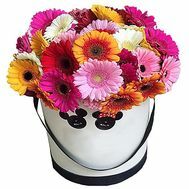 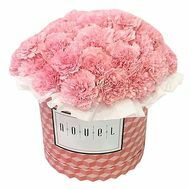 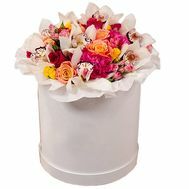 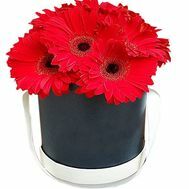 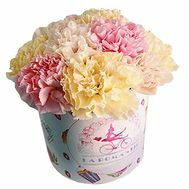 Also, if you want an extremely gentle gift, choose the flowers in a round box. 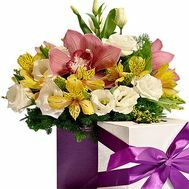 Her form will emphasize the infinity of your tenderness and love for the recipient. 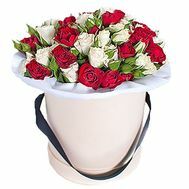 Buy roses in a box with a delivery - a great idea for fans of the original and unusual. 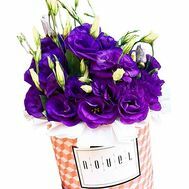 Order a box of flowers in our store, and the flower delivery service will take care of the rest itself! 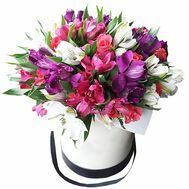 In our shop only experienced florists work, who are always ready to fulfill any your whim. 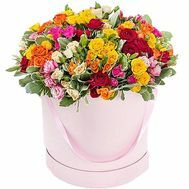 We have more than 10 years of experience in the Ukrainian market, thanks to which there is no doubt as our work. 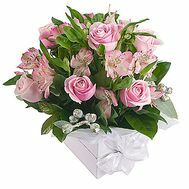 In this you can see for yourself, reading reviews about our work and reviewing the photos of deliveries. 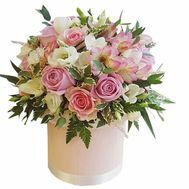 We cooperate only with the best suppliers, and our bouquet delivery service performs timely delivery of absolutely every order. 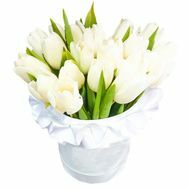 In addition, we provide free shipping in major cities and many payment methods, making buying easier and safer. 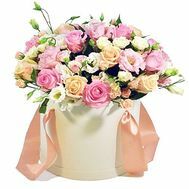 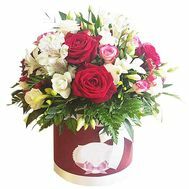 At us everyone can order a bouquet with delivery by the courier, take part in actions, receive discounts and the professional help from managers of shop. 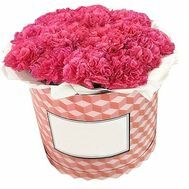 Also for a change, we can add a gift to the bouquet and composition, decorating the hat box with decor, balls, sweets and many others. 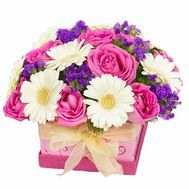 We are always glad to see you in our store and will be happy to help you in any situation!